When I was growing up, we had a huge apricot tree in my backyard. That tree was legendary among the kids of the neighborhood. There were more and less productive years for that tree. One year, I distinctly remember heading to the yard, armed with paper grocery bags doubled up (this was before grocery stores even used plastic bags), and accompanied by my older brother, to muck our way through the deep layer of fruit that laid on the ground rotting. We were charged with scooping it up and throwing it away. I can only remember that one year that produced so much fruit. I know there must have been other years that were heavy, and there must have been plenty of years that weren't quite so impressive. I can't remember ever eating an apricot from that tree, though. What made it legendary wasn't the apricots. It was the. best. climbing. tree. a kid could ever hope for. The tree was pretty huge, as far as fruit trees go. The trunk split into three limbs just about 2 feet off of the ground. Those limbs split pretty quickly, too. Climbing it wasn't any harder than climbing a ladder. 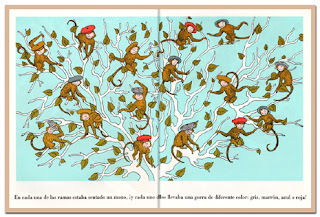 Altogether, this meant that at any given moment the tree could be found full of 10 or more kids, ranging in age from just a couple of years old up to teenagers. We even had a dog at one point who would get up to six feet or so into that tree. Eventually, if I remember correctly, the tree became diseased and had to be cut down. Luckily, that didn't happen until my brothers and I were just about out of the house and well past our tree climbing days. Unluckily, it was before I realized how amazing apricots are to eat and how easy they are to cook with. As I learned this week, stone fruits (those with a pit inside) are divided into two categories: clingstone fruits and freestone fruits. They are just what they sound like -- freestones allow the pit to pop out cleanly, and clingstone fruits hang on to the pit like it's about to bolt for the nearest border. Apricots, thankfully, belong to the freestone group, and getting the pit out of an apricot is about as easy as it gets. Also, the skin of an apricot is sweet and tender, and doesn't need to be peeled off. That means that all the prep work an apricot requires is rinsing, halving and popping out the pit. As I mentioned before, cherry week was speedily ended when I found myself the lucky recipient of a big crate of apricots. These aren't the most beautiful apricots in the world, due to the fact that they survived a hail shower at one point in their youths, as well as the fact that they are ripening at breakneck speed as we speak. They look just fabulous all cooked up, though! 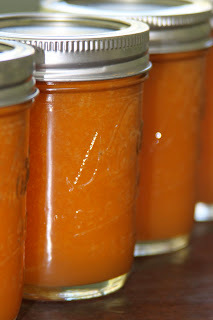 The first thing I was determined to do was to make some apricot syrup. I am not a huge maple syrup gal, as it is just too sweet. Tooth achingly sweet, in my opinion. Apricot syrup, on the other hand, has enough tang to balance out the sweetness and make a stack of pancakes into heaven on a plate. It is pretty simple to make, too. It doesn't take long, since you don't need it to thicken the way you need jam to, and the use of a blender to puree the apricots gets the consistency set for you. Pour the syrup into hot jars. (The jars need to be hot so that the glass doesn't crack when the hot syrup is poured in.) Fill each jar to 1/4 inch from the top. Wipe the edges of the jar clean. Place a lid on each jar, and screw on the band until it is finger-tip tight. Place the jars into a large pot of water, and boil for 5 minutes. (for higher elevations, check this chart for processing times). The water level needs to be 1-2 inches above the top of the jars. After 5 minutes, remove from the water using a jar lifter (or tongs). Let them sit, undisturbed for 12-24 hours. You will know if they are properly sealed if you press on the lid and it doesn't give at all.